If you’re interested in hiring Stanley House as a whole house, you might find it useful to know more about the layout. Two sitting rooms both with doughy sofas. One with TV, video and a wood-burning stove, the other with TV, DVD and Playstation. DVD and video library and a good selection of fiction books and guides. Large drying room and separate downstairs biffy. Entrance hall with wood or tiled floor so no need to stand outside removing wet and muddy boots and clothing. Kitchen opening into dining area and conservatory overlooking the gardens and fells at one side and the steam trains and fells at the other. We can seat 70 people in here at a squash but keep the area set up for 30 generally. 1 x family suite consisting of an entrance hall leading to a spacious bathroom straight ahead, with a twin or double bedroom to your right and a twin or double bedroom to your left. Extra beds can be added to some rooms and cots can be made available on request. All 12 en suite bedrooms are spacious and furnished to a high standard. First floor rooms are dog friendly and second floor rooms are dog free. Flexibility is the key. 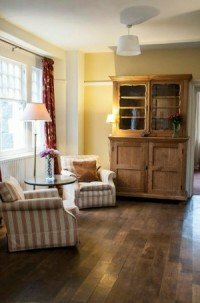 All rooms can interchange between double and twins, making it ideal for groups as well as families. 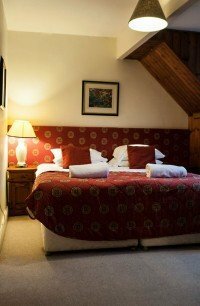 As part of the accommodation, we have 2 two bedroom suites, ideally suited for families, but can be used by all. Off your private hallway lie the two bedrooms with a spacious bathroom in-between, again accessed from the hallway. These can be configured as double and twin, or two doubles, or two twins, plus an extra bed can be put in one of the rooms to accommodate the slightly larger family. Again, each of these rooms have High Definition flat screen televisions with DVD players to keep the younger members of the family entertained in the early waking hours. We can, to a degree, personalize these rooms by removing the tea tray and other items that small fingers tend to play with and leave you to take charge of the remote control! What there is, though, in every room, is a view; to the North there are views of the Fells and the La’al Ratty railway, and to the South views of the gardens, rivers, woodlands and Fells. Different seasons produce different views. Interchangeable, Twin to Double etc. If you need anything specific, not listed here, please let us know. Stanley House has beautiful lawns and gardens which run down to the banks of the confluence of the River Esk and Whillan Beck. Surrounded by magnificent views and quite sheltered, our gardens are lovely for a picnic in the sun, afternoon games or an evening potter.